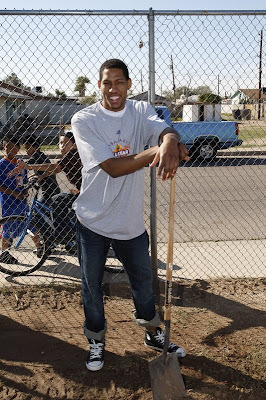 The Converse Blog: Danny Granger In Converse! So the title of this post might be a little misleading, but it is actually true. I really meant to post these before now, but I never got around to it. These are pictures from All Star weekend featuring Danny Granger of the Pacers wearing the classic black core colorway of the Converse All Stars. This was pretty fitting as Granger was making his first All Star game appearance. I got these pictures from yahoo/Getty Images.